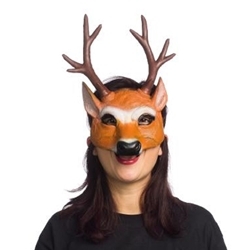 The Deer Half Mask is a one size fits most form fitting mask with elastic tie. Ears and antlers protrude from the top of the mask. This is a fantastic mask for a cute animal costume, and is great for Halloween or for parties. This mask is also suitable for any of Santa’s Reindeer.